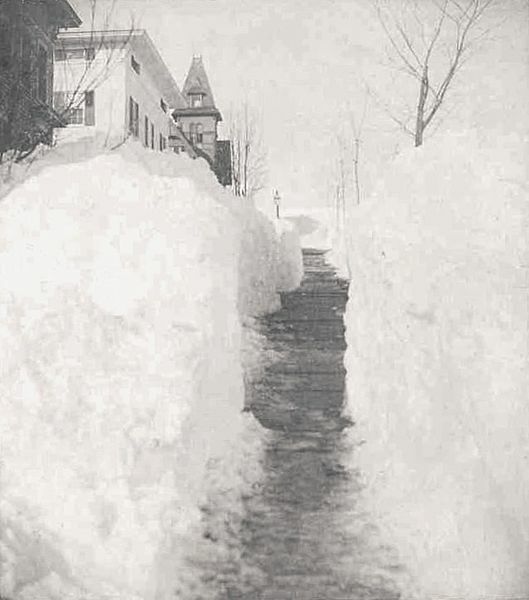 The Great Blizzard of 1888 or Great Blizzard of '88 (March 11 – March 14, 1888) was one of the most severe blizzards in United States' recorded history. Snowfalls of 40-50 inches (102–127 cm) fell in parts of New Jersey, New York, Massachusetts and Connecticut, and sustained winds of over 45 miles per hour (72 km/h) produced snowdrifts in excess of 50 feet (15.2 m). Railroads were shut down and people were confined to their houses for up to a week. The weather preceding the blizzard was unseasonably mild with heavy rains that turned to snow as temperatures dropped rapidly. The storm began in earnest shortly after midnight on March 12, and continued unabated for a full day and a half. The National Weather Service estimated this incredible Nor'easter dumped 50 inches (1.3 m) of snow in Connecticut and Massachusetts, while New Jersey and New York had 40 inches (1.0 m). Most of northern Vermont received from 20 inches (50.8 cm) to 30 inches (76.2 cm) in this storm. Drifts were reported to average 30–40 feet (9.1–12 m), over the tops of houses from New York to New England, with reports of drifts covering 3-story houses. The highest drift (52 feet / 15.8 metres) was recorded in Gravesend, New York. Fifty-eight inches (1470 mm) of snow was reported in Saratoga Springs, New York; 48 inches (1,200 mm) in Albany, New York; 45 inches (1,100 mm) of snow in New Haven, Connecticut; and 22 inches (560 mm) of snow in New York City. The storm also produced severe winds; 80 miles per hour (129 km/h) wind gusts were reported, although the highest official report in New York City was 40 miles per hour (64 km/h), with a 54 miles per hour (87 km/h) gust reported at Block Island. New York's Central Park Observatory reported a minimum temperature of 6°F (-14.4°C), and a daytime average of 9°F (-12.8°C) on March 13, the coldest ever for March. The storm, referred to as the Great White Hurricane, paralyzed the East Coast from the Chesapeake Bay to Maine, as well as the Atlantic provinces of Canada. Telegraph infrastructure was disabled, isolating Montreal and most of the large northeastern U.S. cities from Washington, D.C. to Boston for days. 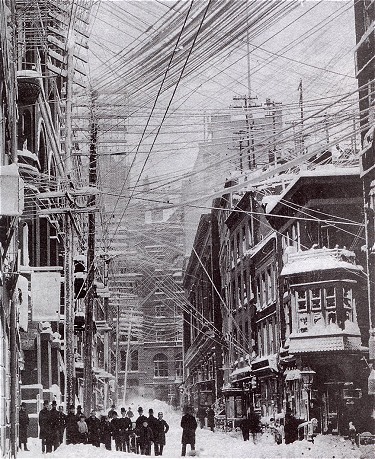 Following the storm, New York began placing its telegraph and telephone infrastructure underground to prevent their destruction. From Chesapeake Bay through the New England area, over 200 ships were either grounded or wrecked, resulting in the deaths of at least 100 seamen. In New York, neither rail nor road transport was possible anywhere for days, and drifts across the New York —New Haven rail line at Westport, Connecticut took eight days to clear; transportation gridlock as a result of the storm was partially responsible for the creation of the first underground subway system in the United States, which opened nine years later in Boston. Fire stations were immobilized, and property loss from fire alone was estimated at $25 million. Severe flooding occurred after the storm due to melting snow, especially in the Brooklyn area, which was more susceptible to serious flooding due to its topography. Efforts were made to push the snow into the Atlantic Ocean. Over 400 people died from the storm and the ensuing cold, including 200 in New York City alone. Among them was former U.S. Senator Roscoe Conkling. The blizzard resulted in the founding of the Christman Bird and Wildlife Sanctuary located near Delanson, Schenectady County, New York. It was listed on the National Register of Historic Places in 1970. I can't even imagine 80mph winds, that's incredible. Who says this can never happen again, time to plan ahead and be prepared.